Love spells are magical, but they really can't make someone love you if there's not already at least a little spark there. What a love spell can do is open the channels of energy and the forces of nature to work on your behalf. To get the most out of any love spell, it's best to ask for the universe to send the right person to you. This way you won't waste your time and energy focusing on someone who might not care for you the way you want. Before you begin, here's one quick tip. You should never use a candle that has been used before. Any time a spell is being cast, you should use virgin candles. Candles can pick up vibrations from their previous use, which causes them to be ineffective if they're used in a different type of spell. You need a virgin white candle that is thick enough to inscribe. A four-inch, altar-style candle works well because it is easy to inscribe and small enough to watch as it burns completely away. Place the candle in a candle holder on your altar. If you do not have an altar, a tabletop is fine. Surround the candle with special objects that mean a lot to you and to the person you love. These precious things can be symbolic, such as a small seashell if you love the ocean, a flower petal of your favorite flower or a special word written on a piece of paper. If you have access to a white rose or a white rose bush, take a thorn and inscribe the candle with it. Write the words All my love come to me on the candle three times. If you do not have a rose thorn, use the tip of a knife, a nail or a needle to inscribe the candle. Place the candle back in the middle of the altar or table and light it. 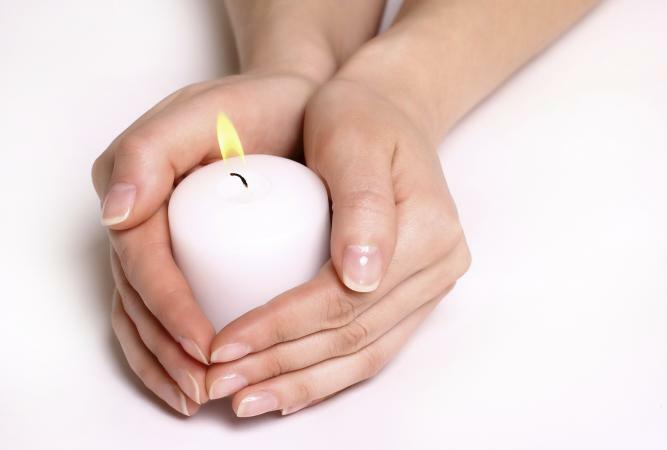 Focus on the candle as it burns, visualizing the person coming to you with love. Keep visualizing and thinking about the person until the candle burns down completely. Once the candle has burned away, wrap the wax puddle that is left and the objects surrounding the candle in a piece of white paper. Put the remains in a safe place. The outcome of this candle love spell means the person will give you all the love they have for you, but you must understand that it could be more or less love than you expected. If the time comes that you no longer want the person to love you, take the love spell remains you wrapped in the white paper and dispose of them. You can do this in any manner you like such as burning the paper with its contents, burying it or simply throwing it away. No one can absolutely guarantee that a love spell will bring you the results you want. However, it can help you to have a more positive outlook, and that kind of energy is bound to make you more open to the opportunities for love that come your way.